Mention tomatoes to any veggie gardener and stand back! From heirloom seeds to cages, those of us who grow tomatoes take it very seriously. And, why shouldn’t we, tomatoes are valuable… Anything that starts out as a love apple and ends up on my beloved BLT and Tacos The Mom Way …. well that’s serious. Last year I asked my garden friends on Twitter and Facebook to tell me their favorite tomatoes. 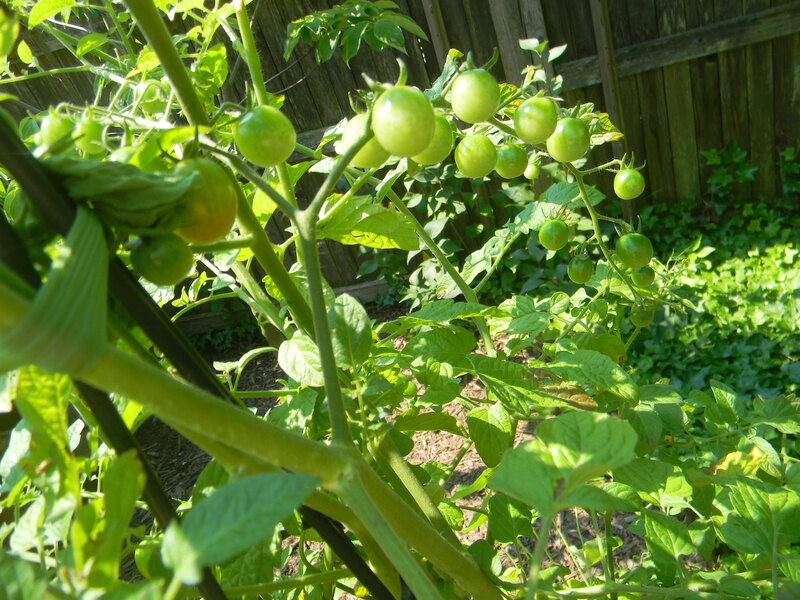 My goal this year is to plant 5 regular sized tomatoes and 3 patio tomatoes. But, my resolve is crumbling and my mouth is watering. TOMATO TRIVIA … Did you know that? Thomas Jefferson first ate a tomato in Paris and sent seeds back to America. According to the U.S. Department of Agriculture, Americans eat between 22-24 pounds of tomatoes per person, per year. Heinz released it’s first bottled ketchup in 1876. Tomato juice is the official state beverage of Ohio. Tomatoes are a natural antioxidant and high in Vitamin C.
In 1897 Joseph Campbell came out with condensed tomato soup. The “Hornworm” can eat an entire tomato plant in ONE DAY. Do you have tomato stories? Ever get in to a tomato frenzy? Come on, you can tell me! I have the same tomato frenzy. I have 18 varieties I’m trying to grow in the garden (1 or 2 of each) plus another 24 of Romas from seeds given to us by a friend. We may be giving the neighbors lots of tomatoes this year. Unless we eat them first. I know. I know. I know. Tomato seeds and plants are so hard to resist! Brandywine was a real winner for us last year!!! Hi teresa – what a seriously beautiful cluster? 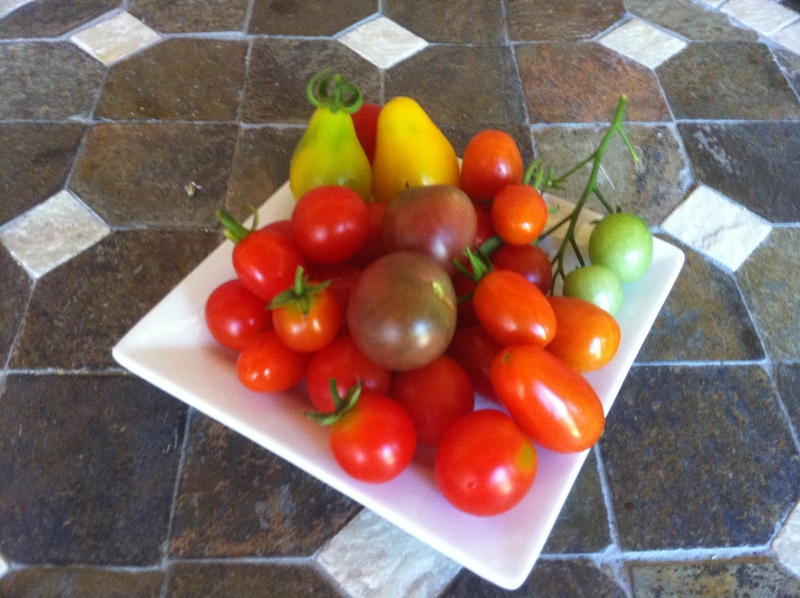 of tomatoes – Seeing you have some trivia – what is the collective noun for tomatoes? Mr S says it’s ‘a crop’ but that sounds very dull. I do love tomatoes – interesting little facts, I especially like what the Germans call them. I can’t wait to bite into a fresh homegrown tomato from the farmers market! Me too!!! Nothing says summer better! I enjoyed your tomato post – especially the historical info. Every year I grow mine from seeds that I saved from a plant that showed up in my flowerbed. I call it trooper since it produced tomatoes even though it was not in our greenhouse the first year. I am so glad to know about Trooper! Plant stories are the best! Enjoy your tomatoes!